Purpose: High-dose (100 mg/m2) cisplatin with radiotherapy is the standard practice in locally advanced head-and-neck squamous cell carcinoma. Use of this regimen in resource- constrained and economically constrained countries like India is difficult. Methods: This study was a cross-sectional survey conducted among Indian oncologists treating head-and-neck cancer. The survey consisted of 25 questions relevant to general day-to-day practice in head-and-neck oncology. It included questions regarding the most common drug used in the concurrent chemoradiation (CRT) setting, the most common schedule of administration of cisplatin, the doses used in once-a-week or once-every-3-week cisplatin chemoradiotherapy, toxicities, and preventive strategies. Descriptive analysis was performed using SPSS software version 20. Results: Responses were obtained from 257 oncologists practicing in various oncology centers throughout the country. The agent most commonly used for radiosensitization was cisplatin (n = 243; 94.6%). The once-a-week regimen of cisplatin was the favored regimen (87.9%, n = 226). The reason for favoring the once-a-week regimen was better tolerance (n = 153, 59.5%). The once-every-3-weeks cisplatin schedule was prescribed for >50% of head-and-neck cancer patients by 23 participants only (8.9%). Conclusion: In this nationwide Indian survey, the majority of clinicians preferred the once-a-week cisplatin schedule for CRT in locally advanced head-and-neck cancer patients, due to better tolerance. High-dose (100 mg/m2) once-every-3-weeks cisplatin along with radiotherapy in the curative setting decreases locoregional recurrences and prolongs overall survival in locally advanced head-and-neck squamous cell carcinoma.,,, However, high-dose cisplatin with radiotherapy leads to significant severe acute and late toxicities, which are difficult to manage in resource-constrained settings (low bed-to-patient ratio and high cost of supportive care) in the developing world. This difficulty might lead to suboptimal cisplatin dose administration, with resultant decreased dose intensity, leading to suboptimal response and increase in toxicity-related deaths. Low-dose once-a-week schedule of cisplatin results in better compliance because it is relatively easy to administer, requires less supportive care, and has the added advantage of fewer toxicities, which can be managed on an outpatient basis.,,, Low-dose once-a-week cisplatin has been commonly used in various clinical trials and is recommended in official guidelines.,, Hence, this schedule is commonly used in Asia. However, in a Phase III randomized study done from India (W3W), low-dose once-a-week cisplatin was shown to lead to an inferior outcome in terms of locoregional control compared to once-every-3-week 100 mg/m2 regimen. We performed this survey to analyze the data across various oncology centers in India, related to the use of cisplatin regimens, the difficulties faced using such regimens, and how they are managed, after the presentation of the W3W trial data. A cross-sectional study was conducted among Indian oncologists over 20 days in the form of an anonymized survey pertaining to the patterns of practice of concurrent chemoradiation (CRT) in head-and-neck cancer in India. An online form was prepared using Google Forms (Google, Mountain View, CA, USA), along with a PDF version. Participants received a link to the survey form to participate in the survey via Google Form invitation and/or SurveyMonkey (SurveyMonkey, San Mateo, CA, USA). We sent out a reminder E-mail to all participants 15 days after the initial request to complete the survey. In addition, the paper-based survey was performed during the Best of ASCO-2017 Conference in India. Participants who had not responded electronically were encouraged during the conference to fill their responses. Data were collected automatically from electronic responses in a spreadsheet that was linked to the online form and were manually entered into the same spreadsheet from paper responses. The survey population consisted of 1583 adult oncology practices including regional cancer centers, teaching institutes, government hospitals with oncology setup, and private oncology centers who were treating head-and-neck cancer. We used a convenience sample because there was no official database of oncology practitioners in the country at the time the survey was conducted. The authors also personally contacted medical and radiation oncology colleagues working in various private hospitals across the country (our personal contacts). The survey included questions regarding the most commonly drug used in the CRT setting, the most common schedule of cisplatin, the doses used in once-a-week or once-every-3-week cisplatin, the toxicities and preventive strategies, individual preferences with reasons for the same, and treatment compliance. Response options in the survey included a 4-item Likert scale (always, usually, rarely, and never), a binary scale (yes or no), or a multiple-choice format, depending on the type of question. In addition, we inquired about the important factors that prevented the center from fully implementing the once-every-3-week regimen. Questions regarding the setting of oncology practice were also added. These questions included type of institute (teaching/government/private center), area of expertise (medical oncologist/radiation oncologist/surgical oncologist/physician), years of experience of oncology practice, number of head-and-neck cases seen in a month, and the most common subsite encountered. SPSS software version 20 (Armonk, NY, IBM Corp.) was used for analysis. Descriptive statistics were performed. The continuous variables were described in terms of median values with interquartile range, while ordinal and nominal variables were described in terms of percentage with their 95% confidence intervals. Of the 1583 invites that we sent out, 257 (16.2%) oncologists practicing in various oncology centers throughout the country responded. Detailed baseline characteristics of participants are summarized in [Table 1]. The majority, 123 (47.9%), were from the private oncology setup, 164 (63.8%) were radiation oncologists, and 109 (42.8%) had between 1 and 5 years of experience of oncology practice. The most common subsite of head-and-neck cancer seen was oral cavity (n = 154, 60.6%). The concurrent chemotherapy preferences are summarized in [Table 2]. The agent commonly used for radiosensitization was cisplatin (n = 243; 94.6%). The once-a-week regimen of cisplatin was the favored regimen (87.9%, n = 226). The dose of 40 mg/m2 of cisplatin was used by 59.9% of participants (n = 154). The reason for favoring the once-a-week regimen was mainly due to its better tolerance (n = 153, 59.5%). The three commonest perceived toxicities due to once-every-3-weeks regimen which resulted in this preference were myelosuppression (n = 95, 37%), mucositis (n = 88, 34.2%), and renal function derangement (n = 42, 16.3%). The once-every-3-week cisplatin schedule was prescribed for over 50% of head-and-neck cancer patients by only 23 participants (8.9%). The cisplatin dose of 100 mg/m2 either on single day or divided over 2 days was the most common dose schedule used, when the once-every-3-week schedule was contemplated by the participants (163, n = 63.5%). The patients' age cutoff of 70 years was used by 156 (60.7%) participants while using once-a-week schedule of cisplatin. The corresponding age limit for the once-every-3-week cisplatin schedule was 60 years and 116 participants (45.1%) concurred. However, 103 participants (47%) felt that for the once-every-3-week regimen, there was no age cutoff. The serum creatinine was checked before each cycle of cisplatin by 248 (97.5%) participants. The weight of the patient was monitored during chemoradiation by 188 participants (73.2%). One hundred and twenty-one participants (47.1%) monitored the patients' weight at each visit and 67 monitored it at least once or twice during treatment (26.1%). These 188 participants (73.2%) also suggested that cisplatin doses were modified by them in case of weight changes. Serum creatinine clearance was calculated before each cycle by 159 participants (61.9%). Diuretics were administered during once-a-week and once-every-3-week schedule by 158 (61.5%) and 162 participants (63%), respectively. Mannitol was the most favored diuretic in both once-a-week (n = 151) and once-every-3-week schedules (n = 153). Treatment of cancer patients is guided by evidence and treatment guidelines. India is a resource-constrained setting, with a heavy patient burden and lack of uniform national practice guidelines, which leads to wide variation in the clinical application of evidence and recommended guidelines. A variation in practice is seen either when multiple treatment options are available (which are equivalent) or when limited evidence is available (gray zone area). In head-and-neck cancer, cisplatin is the preferred agent for CRT. However, the schedule of cisplatin was a gray zone area. However, the results of the W3W study helped settle some of these controversies, at least in the adjuvant setting. Hence, the results of our survey conducted in the aftermath of the W3W data presentation came as a surprise that in this nationwide survey, despite awareness of the superiority of the once-every-3-week schedule, nearly 90% of participants still preferred and used the once-a-week schedule. The reason for these preferences seems largely due to the better tolerance of the once-a-week schedule. The participants were concerned about the higher rates of myelosuppression, mucositis, and renal injury caused by the once-every-3-week schedule. Limited resources could partly explain the marked preference for the once-a-week schedule despite evidence that this is not the optimal regimen. The higher rates of adverse events with the once-every-3-week schedule meant higher requirement of hospital admission and increased cost of supportive care. Multiple factors limit these requirements. The bed-to-patient ratio is dismal in a majority of centers. In fact, according to the World Health Organization report, India ranks as one of the lowest in this regard. Another reason for the preference of once-a-week schedule is the low cost of supportive care. Very limited funds are allocated for concurrent chemotherapy in the various government schemes, especially in Asia.,, These funds are just adequate for acquisition of the drug and medications required for the administration of cisplatin. No funds are allocated or provided for supportive care. A single episode of febrile neutropenia or aspiration pneumonia or requirement of parenteral nutrition requires funds which are higher than the total funds allocated for concurrent chemotherapy. In India, this cancer is seen mainly in patients of low socioeconomic status and hence these patients cannot afford the cost of supportive care without additional financial support. The once-a-week schedule of 40 mg/m2 was the preferred regimen when the once-a-week schedule was chosen. This reflects the effect of the National Comprehensive Cancer Network recommendation. The dose of 40 mg/m2 however has very low level of evidence. Only one randomized study has been reported which has compared this dose to radiation alone. The trial suggested that this dose does improve overall survival in comparison with only radiation. However, the interpretation of this study is difficult as nearly 40% of patients in chemoradiation arm were of nasopharyngeal cancer as opposed to only 8% in radiation arm. Further, in spite of this discrepancy, the progression-free survival was similar in both arms, but surprisingly, overall survival was higher in chemoradiation arm. Whether this difference would have been due to the better survivals associated with palliative chemotherapy in nasopharyngeal cancer is an unanswered question. Nearly 30% of our participants were using the 30 mg/m2 once-a-week schedule. This is due to two trials done: one in the radical setting and another in the adjuvant setting, showing benefit of this schedule over radiation alone. It was heartening to know that nearly all participants checked serum creatinine before each cycle. The weight was monitored by the majority. However, there seemed to be a division on the use of diuretics, reflecting the limited evidence of its use. In this nationwide Indian survey, the majority of clinicians preferred the once-a-week cisplatin schedule for CRT in locally advanced head-and-neck cancer patients, due to better tolerance. Pignon JP, le Maître A, Maillard E, Bourhis J, MACH-NC Collaborative Group. Meta-analysis of chemotherapy in head and neck cancer (MACH-NC): An update on 93 randomised trials and 17,346 patients. Radiother Oncol 2009;92:4-14. Forastiere AA, Goepfert H, Maor M, Pajak TF, Weber R, Morrison W, et al. Concurrent chemotherapy and radiotherapy for organ preservation in advanced laryngeal cancer. N Engl J Med 2003;349:2091-8. Forastiere AA, Zhang Q, Weber RS, Maor MH, Goepfert H, Pajak TF, et al. Long-term results of RTOG 91-11: A comparison of three nonsurgical treatment strategies to preserve the larynx in patients with locally advanced larynx cancer. J Clin Oncol 2013;31:845-52. Kumar S, Pandey M, Lal P, Rastogi N, Maria Das KJ, Dimri K, et al. Concomitant boost radiotherapy with concurrent weekly cisplatin in advanced head and neck cancers: A phase II trial. Radiother Oncol 2005;75:186-92. Jeremic B, Shibamoto Y, Stanisavljevic B, Milojevic L, Milicic B, Nikolic N, et al. Radiation therapy alone or with concurrent low-dose daily either cisplatin or carboplatin in locally advanced unresectable squamous cell carcinoma of the head and neck: A prospective randomized trial. Radiother Oncol 1997;43:29-37. Jeremic B, Shibamoto Y, Milicic B, Nikolic N, Dagovic A, Aleksandrovic J, et al. Hyperfractionated radiation therapy with or without concurrent low-dose daily cisplatin in locally advanced squamous cell carcinoma of the head and neck: A prospective randomized trial. J Clin Oncol 2000;18:1458-64. Bartelink H, Van den Bogaert W, Horiot JC, Jager J, van Glabbeke M. Concomitant cisplatin and radiotherapy in a conventional and modified fractionation schedule in locally advanced head and neck cancer: A randomised phase II EORTC trial. Eur J Cancer 2002;38:667-73. Gupta PK, Lal P, Bajpai R, Goel A. Long term results of comparison of concurrent low-dose daily cisplatin versus the standard weekly cisplatin with six fractions per week radiotherapy in locally advanced head neck cancer. J Cancer 2016;5:80-4. Ghosh-Laskar S, Kalyani N, Gupta T, Budrukkar A, Murthy V, Sengar M, et al. 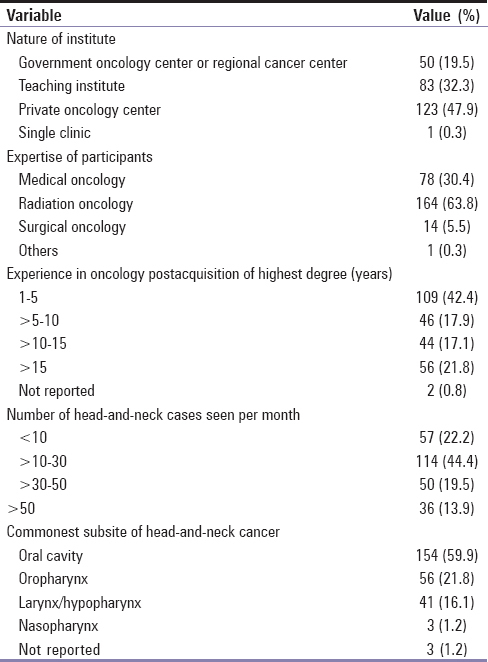 Conventional radiotherapy versus concurrent chemoradiotherapy versus accelerated radiotherapy in locoregionally advanced carcinoma of head and neck: Results of a prospective randomized trial. Head Neck 2016;38:202-7. Pfister DG, Spencer S, Brizel DM, Burtness B, Busse PM, Caudell JJ, et al. Head and neck cancers, version 1.2015. J Natl Compr Canc Netw 2015;13:847-55. Data for India, Lower Middle Income | Data Available from: https://www.data.worldbank.org/?locations=IN-XN. [Last accessed on 2018 Oct 31]. Globocan 2012 – Home. Available from: http://www.globocan.iarc.fr/Default.aspx. [Last accessed on 2015 Aug 19]. World Health Organization, Hospital Beds; 13 July, 2017. Available from: http://www.searo.who.int/entity/health_situation_trends/data/chi/hospital-beds/en/. [Last accessed on 2018 Oct 31]. Haitsma G, Patel H, Gurumurthy P, Postma MJ. Access to anti-cancer drugs in India: Is there a need to revise reimbursement policies? Expert Rev Pharmacoecon Outcomes Res 2018;18:289-96. Philip CC, Mathew A, John MJ. Cancer care: Challenges in the developing world. Cancer Res Stat Treat 2018;1:58-62. Rajiv Gandhi Jeevandayee Arogya Yojana. Available from: https://www.jeevandayee.gov.in/MJPJAY/marathi/index.html. [Last accessed on 2018 Oct 31]. Dandekar M, Tuljapurkar V, Dhar H, Panwar A, DCruz AK. Head and neck cancers in India. J Surg Oncol 2017;115:555-63. Sharma A, Mohanti BK, Thakar A, Bahadur S, Bhasker S. Concomitant chemoradiation versus radical radiotherapy in advanced squamous cell carcinoma of oropharynx and nasopharynx using weekly cisplatin: A phase II randomized trial. Ann Oncol 2010;21:2272-7. Laskar SG, Chaukar D, Deshpande M, Chatterjee A, Hawaldar RW, Chakraborty S, et al. Phase III randomized trial of surgery followed by conventional radiotherapy (5 fr/Wk) (Arm A) vs. concurrent chemoradiotherapy (Arm B) vs. accelerated radiotherapy (6fr/Wk) (Arm C) in locally advanced, stage III and IV, resectable, squamous cell carcinoma of oral cavity – Oral cavity adjuvant therapy (OCAT): Final results (NCT00193843). J Clin Orthod 2016;34 Suppl 15:6004.